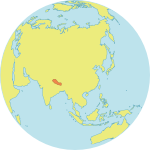 DHUNKHARKA, Nepal – Shuvadra Acharya, 28, gave birth only one day before Nepal’s devastating 7.8-magnitude earthquake. When the quake struck, her house began to shake apart – with her and the baby inside. “The wall of my house collapsed immediately,” she told UNFPA in Dhunkharka, a community in Kavre District. She escaped with the baby, but their ordeal was only beginning. “I trembled with fear for days,” she said. Whole communities were left homeless and in need of urgent medical care. To protect themselves from aftershocks, Ms. Acharya and many of her neighbours slept outdoors or in temporary shelters. Ms. Acharya also required post-partum care, and pregnant women in the community needed antenatal care and safe delivery services. To meet their needs, mobile reproductive health camps are delivering a wide range of sexual and reproductive health services in remote, quake-affected communities. Over 1,000 health facilities were destroyed or severely damaged by the disaster, according to a report by the United Nations Office for the Coordination of Humanitarian Affairs. “About 32 per cent of facilities providing specialized maternal and neonatal services were also destroyed,” said the report. In the 14 worst-affected districts, 1.4 million women and girls of childbearing age are affected by the disaster, including 93,000 pregnant women. Of these, an estimated 10,300 will give birth each month. The mobile reproductive camps were initiated on 30 April through a collaboration between UNFPA, local health authorities and NGO partners, including the Family Planning Association of Nepal and the Adventist Development and Relief Agency. Roughly one to two of these temporary camps have been set up each day. 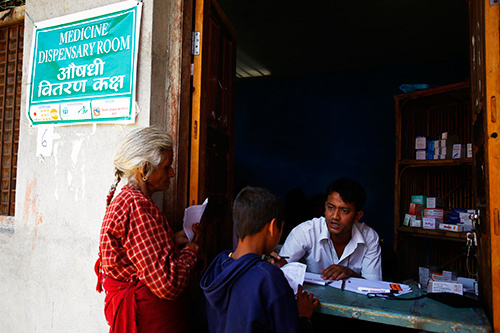 Doctors and skilled birth attendants at the camps provide a full range of services, including general check-ups, antenatal care, safe delivery services, post-partum care, and family planning counselling and care. Auxiliary health workers also perform lab services, including testing for HIV and other sexually transmitted infections (STIs). 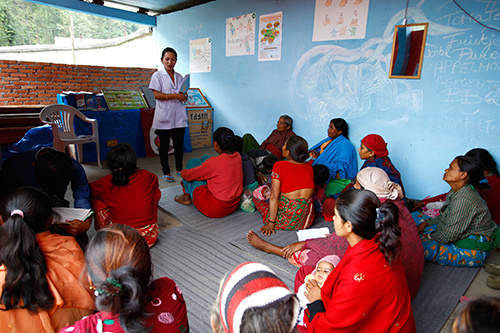 “It’s a huge relief to the pregnant women and new mothers, as many of them are still living in temporary shelters without the care they need,” said Aapsara Nepali, a community health volunteer. The camps also have adolescent-friendly areas, where health educators provide age-appropriate information, education and care to young people, including lessons on STIs, human rights, gender-based violence and other issues. “Every piece of information related to our health is helpful,” said Rama Kumari Shrestha, 22, at the camp in Dhunkharka, which operated from 22 to 24 May. In just three days, the camp reached more than 590 people. Reproductive health kits are also provided to local health workers, and dignity kits containing hygiene supplies and warm clothing are distributed to women and girls. Counsellors have also been deployed to provide psychosocial support to those who need it. UNFPA, together with the Ministry of Women, Children and Social Welfare, recently launched Dignity First, a campaign to raise awareness of the unmet reproductive health, hygiene, and protection needs of earthquake survivors. 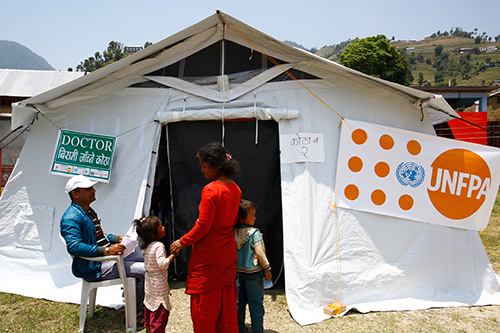 “Be it adolescent girls, lactating women or new mothers, their dignity can be restored when they have an unhindered access to the services they need the most in times of humanitarian crisis,” said Giulia Vallese, UNFPA’s Representative in Nepal.